Ed Hubbard was born in 1938 in Kansas City, Missouri. He enlisted in the U.S. Air Force Reserve on June 24, 1955, and served as a flight engineer on C-119 Flying Boxcar transports with the 303rd Troop Carrier Squadron of the 442nd Troop Carrier Wing at Grandview AFB (renamed Richards-Gebaur AFB in 1957), Missouri, until August 20, 1961, when he was accepted into the Aviation Cadet Program. 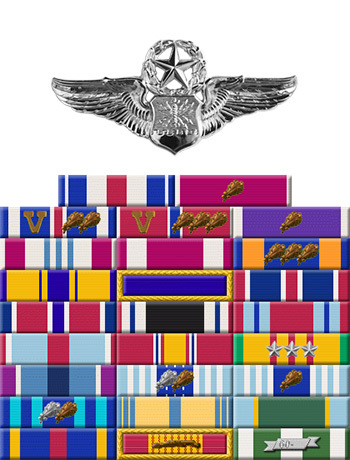 Hubbard was commissioned a 2Lt and was awarded his Navigator Wings on July 6, 1962. After completing Navigator-Bombardier training, photo reconnaissance school, and RB-66 Destroyer combat crew training, Lt Hubbard was assigned to the 30th Tactical Reconnaissance Squadron at RAF Alconbury in England from October 1963 to July 1965. He was next assigned to the 42nd Tactical Reconnaissance Squadron at Chambley AB, France, from July to October 1965, and then with the 19th Tactical Reconnaissance Squadron, also at Chambley, from October 1965 to June 1966. Hubbard began flying combat missions as an EB-66C Navigator with the 41st Tactical Reconnaissance Squadron flying out of Takhli Royal Thai AFB, Thailand, in June 1966, and he was forced to eject over North Vietnam on his 26th combat mission on July 20, 1966, and was immediately captured and taken as a Prisoner of War. After spending 2,420 days in captivity, Capt Hubbard was released during Operation Homecoming on March 4, 1973. After hospitalization for his injuries, he completed Air Command and Staff College at Maxwell AFB, Alabama. Hubbard next completed F-4 Weapons Systems Officer upgrade training before being assigned to the 58th Tactical Fighter Squadron of the 33rd Tactical Fighter Wing based at Eglin AFB, Florida, where he served from June 1975 to July 1976. He then served with the 3246th Test Wing, also at Eglin, from July 1976 to August 1979. 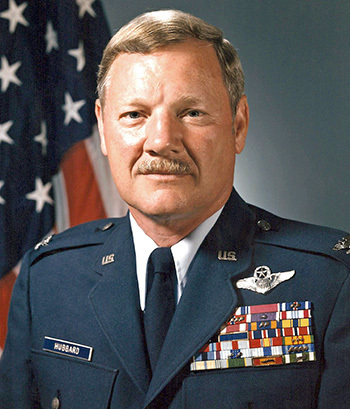 Hubbard attended the Air War College at Maxwell AFB, Alabama, from August 1979 to May 1980, and then returned to Eglin AFB to serve as Director of Safety with the Munition Systems Division until his retirement from the Air Force on July 31, 1990. For the period August 1967: This officer distinguished himself by gallantry and intrepidity in connection with military operations against an opposing armed force during the above period while a Prisoner of War in North Vietnam. Ignoring international agreements on treatment of prisoners of war, the enemy resorted to mental and physical cruelties to obtain information, confessions, and propaganda materials. This individual resisted their demands by calling upon his deepest inner strengths in a manner which reflected his devotion to duty and great credit upon himself and the United States Air Force.